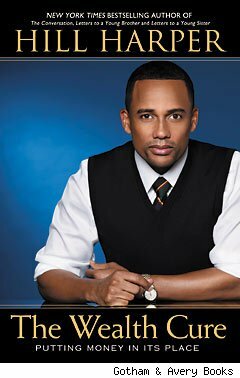 Actor and author Hill Harper dispenses can't-buy-happiness philosophy in his new book The Wealth Cure: Putting Money in Its Place (Gotham/Penguin, $26). At its heart is advice for avoiding the predicaments that pile up when we obsess about material gain. Debt tops the list. "Whether it's your own personal finance or governmental debt, it can have a huge negative impact on the way we conduct our lives," he told The Price of Fame. "It's amazing many of us are blind to it as we're running it up." Harper, 45, isn't averse to fiscal comfort. He earns a substantial living playing Dr. Sheldon Hawkes on the CBS crime drama CSI: NY. 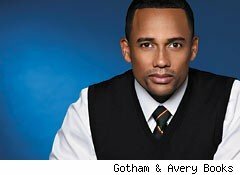 He's also the author of the bestseller Letters to a Young Brother and the recent The Conversation: How Black Men and Women Can Build Loving, Trusting Relationships. "We don't want to act like money isn't important," he said. The Wealth Cure could fit comfortably in the self-help or personal finance aisle, melding together life strategies, wisdom from family and strangers he meets on a cross-country train ride, and nuts-and-bolts budgeting advice. It's a guide that doesn't promise to get you rich quick, but to quickly help your life get richer. As someone who has succeeded in acting and writing after graduating from Harvard Law School (where he befriended a fellow student named Barack Obama), Harper might be hard to accept as an Everyman -- even if he did mop floors at night as he tried to break into show business. But his battle against a life-threatening illness provides an urgent perspective that could appeal to people of any background. When the subject came up, he pointed out how medical costs cause the most personal bankruptcies among Americans. Hill said he was lucky to have health insurance through the Screen Actors Guild. He urged even the poor to explore some sort of coverage to avoid financial catastrophe. He also encouraged everyone across the economic spectrum to save, because studies show that socking away even small amounts is enough to make people feel better about themselves. On the flip side, the author explained that he isn't trying to scare the more prosperous into welding their wallets shut, as a lot of personal finance books do. "They want to make you feel guilty for spending anything," he said. "That's not a way to live. That's not a way to be happy. If you really use money as a tool, it should not cause a measure of guilt. It should be something you're using proactively. My computer is a tool. A wrench is a tool. If we see money that way, we won't feel guilty." A home entertainment system purchased with plastic -- and damn the carryover balance -- isn't a tool. The Wealth Cure differentiates between smart money and dumb money. Dumb money is spending on items that will cost you more over time. Big-ticket electronics and other depreciating assets that can carry monthly interest, such as expensive cars, qualify. Smart money, such as tuition for an education, constantly increases in value. TPOF reminded Hill that his art collection doesn't appreciate all the time -- but Hill countered that it always inspires him, which makes it smart money. "The smartest money is not some monetary investment, but it's really investing money in yourself," he said. The craziest money of all, then, belongs to the addicted. Hill has a warning (and a prescription in the book) for those poisoned by the pursuit of lucre. "It's a never-ending chase," he said. "You'll never be fulfilled." Harper's Uncle Frank summed it up on page 121: "If you are making any decision solely based on money, then it is the wrong decision."